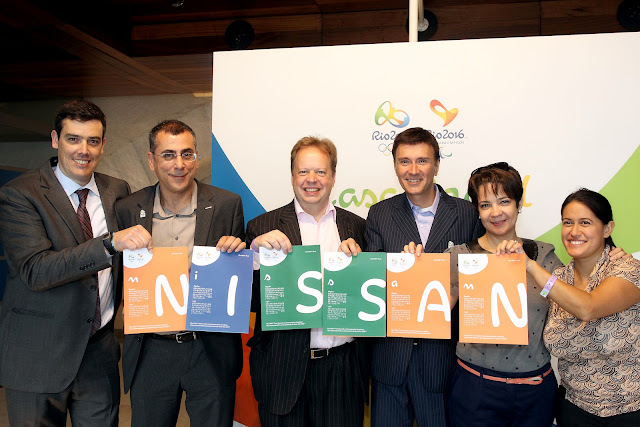 Nissan representatives are in London to follow the Olympic Games and actions performed by the Rio 2016™ team. During their visit at Casa Brasil they posed for a picture where they held cards with letters that formed the company's name, written with the new Rio 2016™ font. The Rio 2016™ new font was launched last Monday (23) and was inspired by the letters and numbers from the Rio 2016™ logo and also in the essence of the Rio 2016™ Games: Passion and Transformation.